Author: Rosenfelt, David Set In . . . 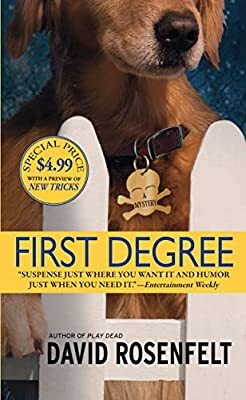 Description: No one can separate defense attorney Andy Carpenter from his golden retriever, Tara, and she returns his affection, standing loyally beside him through every investigation, no matter how dangerous or puzzling-and he is about to be confronted with one of his most difficult cases yet. When a cop's body is found burned and decapitated, the last thing Andy expects is for a stranger to waltz into his office and admit to the crime. For the wisecracking millionaire attorney suffering from "lawyer's block," the case looks like a no-brainer, until the cops pick up another suspect: Andy's lead P.I., Laurie Collins, who happens to be the love of his life. Soon Laurie's case is looking bleak and Andy is becoming increasingly desperate. All he had wanted was a case to sink his teeth into. Now he gets one that's a kick in the head . . . and the heart.